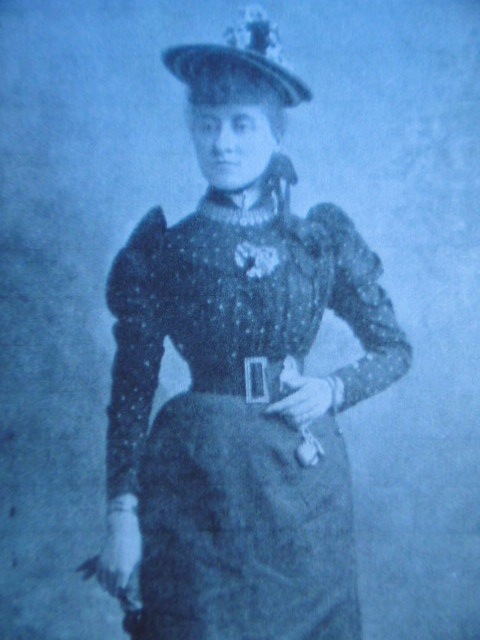 Miss Clara Millard, c.1894. Photograph by Jones & Co., Surbiton. Image from ‘The Sketch’, March 14th 1894, p.348. The article was entitled ‘A Curio Collector, a visit to Miss Clara Millard’ and gives us an insight into the social demographic of women curiosity/antique dealers in the period (it is evident, for example, that Clara was from a well-to-do family), and the kinds of objects that circulated in the trade in the late 19th and early 20th century. Millard mentions a few objects that she had sold in her shop in Teddington, including ‘a set of seven spa diamond buttons worn by Garrick at the Stratford Jubilee’ – The Shakespeare Jubilee took place in September 1769, and was organised, and partly financed, by the actor-manager David Garrick (1717-1779). She also mentioned that she also sold the library table used by Napoleon when in exile at Longwood House, St. Helena. The effects of Longwood House were sold in 1822 and there were several library tables in that sale – for an exemplary description and analysis of Napoleon’s furniture at Longwood House see Martin Levy, Napoleoon in Exile, the houses and furniture supplied by the British Government for the Emperor and his Entourage on St. Helena (Furniture History Society, 1998). Perhaps the library table that passed through Clara Millard’s stock was the famous table that was also subsequently sold at the auction sale of the library and effects of John Copling in 1867, who seems to have acquired a number of Napoleonic relics. The table in question was described in 1867 as ‘A 6ft LIBRARY TABLE of mahogany and yew, banded with ebony…..constantly used by Napoleon himself in his cabinet’ (see Levy, p.66) – this table certainly appears to have been the most famous of the library tables dispersed at Longwood House in 1822. One wonders how Millard obtained the table, and to whom she sold it? ‘ When I was sixteen I had to decide upon some way of earning my own living….I had always lived with people who liked nice things, and I understood a little about curios, so I started a sale of china and curiosities. 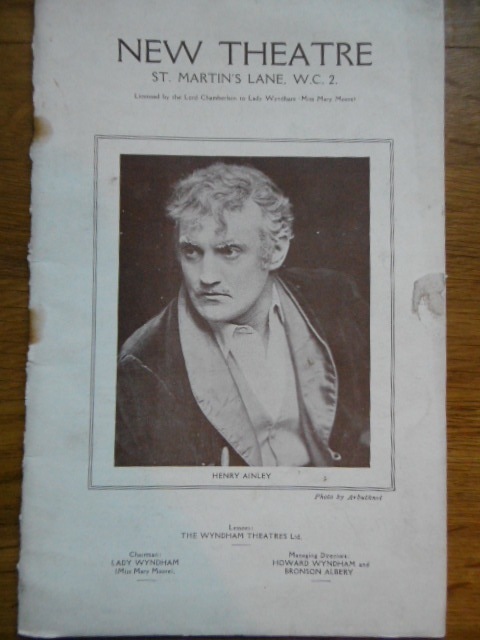 I prepared a catalogue, and sent it round to collectors and wealthy people. The catalogue was a happy thought; it attracted notice and the whole transaction was so successful that I went on as I had begun. I must not forget to tell you that I owe a great deal to the kind help and teaching given to me by Lady Charlotte Schreiber, Lady Currie and Baron Rothschild. Thanks to them, I made fewer mistakes that I should otherwise have done. Then, I have had a larger share of good luck than falls to the lot of most people’ (The Sketch, p.348). Millard’s connections to Lady Charlotte Schreiber (1812-1895), daughter of the 9th Earl of Lindsey, and a major collector of ceramics, as well as to Baron Rothschild (1840-1915) and Lady Currie (1843-1905), is indicative of the intimate relationships between dealing and collecting, and of the significance of social and cultural networks in the history of the antique trade. 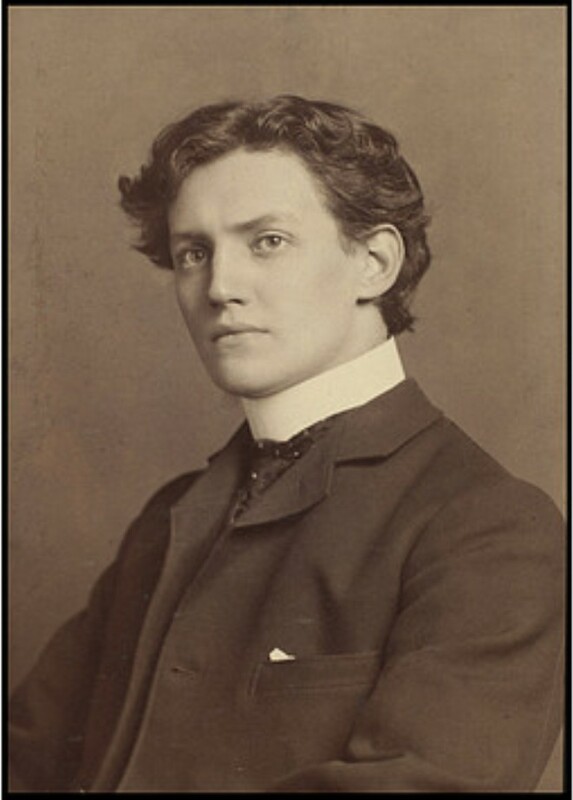 It’s also worth mentioning that Clara Millard was also well known, in the 1890s, as an antiquarian book dealer – which also draws further attention to the overlapping practices that constitute the ‘antique trade’ (see earlier blog posts on these notions). Our lead volunteer, Chris Coles, interviewed the antique ceramics specialist dealer Simon Spero in London the other week – thank you both to Simon and to Chris for taking the time to do the interview! 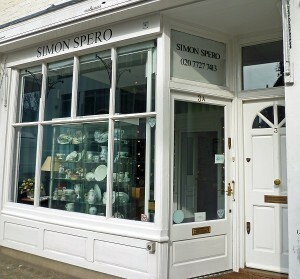 Simon Spero’s shop, London, c.2010. Image, wikicommons. Here’s Simon’s shop in London (above) – the interview gives us a fascinating insight into the world of the specialist dealer. During the interview Simon told us that he’s always been a collector, from his earliest age, and his dealing activities are clearly networked into personal conversations with collectors – he eschews the internet, for example. Many of you will also know Simon as an author, and his published books on 18th century English ceramic factories are regarded as key reference works for collectors. 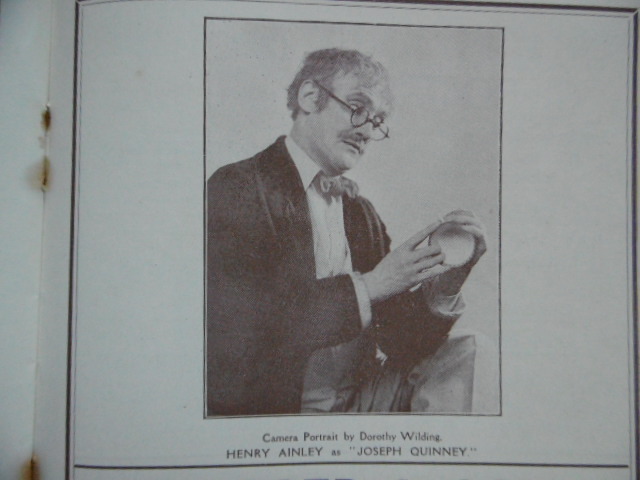 The interview includes Simon’s reflections on his first shop (in Kentish Town, London) and his recollections on influential dealers in ceramics such as Reg Andrade in Plymouth, and Robert Williams from Winifred Williams (London), as well as some of the major ceramics collectors he has sold to over the years. It’s an amazingly detailed account of the world of the ceramic specialist dealer-scholar-collector and will be of considerable interest to those interested in the history of the antiques trade. And, like all of the other interviews we are undertaking as part of the Antique Dealers research project, a version of the interview will be available via the project websites in the coming months. Four more of our undergraduate students, studying on the Art Market module, have signed up as volunteers to add data to the interactive map website – great news, as the map website is now picking up speed on the number of dealer entries etc! Here are our new volunteers, Angharad-Lambourne-Wade, Lydia Haines, Miranda Carins and Oliver Getley, all in my office at the University of Leeds after an intensive induction session on how to add data to the website – it’s actually a bit easier than one thinks, after getting used to the sequences of data input! 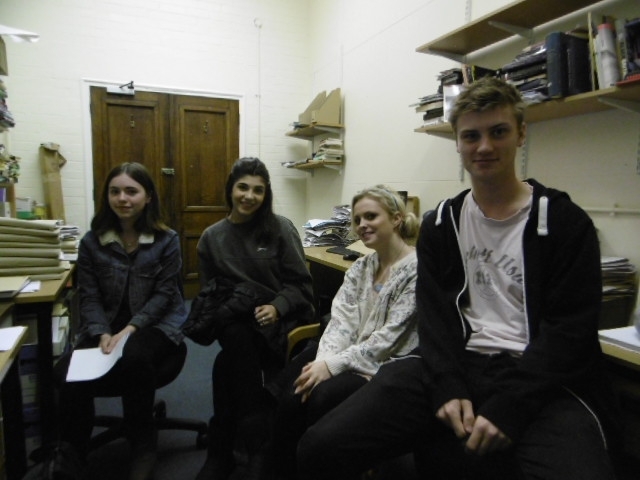 Angharad, Lydia, Miranda and Oliver – new student volunteers on the Antique Dealer research project. Thank you again to all our volunteers on the Antique Dealer research project – all the help you offer is invaluable to the project!